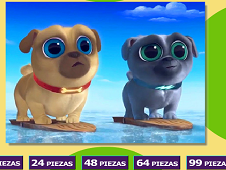 Puppy Dog Pals Games is a new interesting category offered in exclusivity by our site for all the girls and the boys who love the new animated television series from Disney Junior which has in foreground two cute puppies, Bingo and Rolly. In the series you will see the brothers` adventures in the neighborhood when their owner is not home. Their owner`s name is Bob and he is an inventor. he makes all kind of devices and sometimes the puppies try them and destroy them. They always get in trouble and they have to find a way to solve the problems and to get out of the troubles before Bob come home. They are not alone, because they have also a cat sister called Hissy. 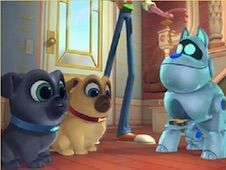 There is also a robot dog named ARF which lives in the same house with the dogs. They all belong to Bob which loves animals and inventions. ARF is one of his best inventions so he decided to keep it for himself. In this animated television series you can have a lot of fun watching our heroes in their adventure. They have to work together all the time in order to complete their missions, to get out of troubles. They are a great team and they always come successfully out of troubles and have fun along the way. They always learn a new important lessons. They know how to learn from their mistakes in order not to repeat them and you can follow their adventure if you want to complete these games successfully. If you can not handle the challenges from the firs attempt you do not have to give up, you have to try again and again until you make it. 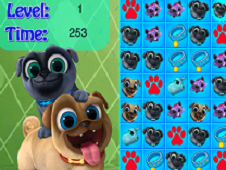 I am going to bring you all kind of challenges in Puppy Dog Pals Games category, challenges for all the kids, boys and girls. I am sure you will not get bored because we have a lot of interesting games here on our site. Do not give up if you can not handle the challenges from the first attempt. YOu have to be persistent if you want to prove what you can. Bingo is the leader of the brothers and he wears a blue collar. Rolly is very silly and he is not very smart. He is 7 years old and he always listens to Bingo which is elder. He wears a red collar and he has a bad habit to chew everything in his way. Hissy is the eldest because she is 10 years old. 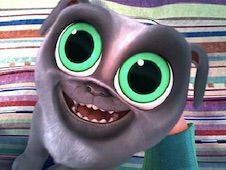 She is a cute cat and she is very sarcastic with the other characters. Sometimes she goes in adventures with Bingo and Rolly. I think you will enjoy this new category appeared on our site and if you do you can give us a like. 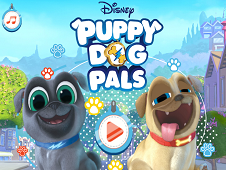 If you enjoy the Puppy Dog Pals Games category we are going to bring you more and more games each week. 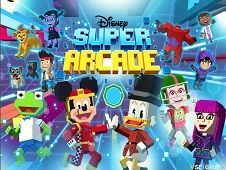 New games appear every day on our site, at least ten and new categories every week with interesting characters from cartoons, movies and series. 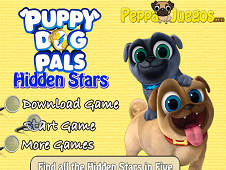 In the Puppy Dog Pals Games category you will get a lot of ability games, for example a hidden stars game where you need agility and a good observation spirit to find all the stars hidden in images with your heroes from cartoons. If you are fast enough I am sure you can spot all the stars in a short time. You will get points for the time. 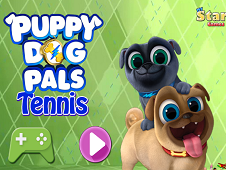 In another game appeared in Puppy Dog Pals Games category you will play table tennis and you have to score 11 points before the opponents if you want to win the match. If you lose you have to try again because with training you will become better at tennis. 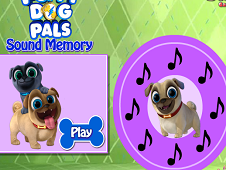 Leave us a comment to tell us which was your favorite game from Puppy Dog Pals Games category. If you can not handle the challenges you should read carefully the indications and I am sure you can do better. Let us know which was the most difficult game in your opinion and what other categories you want here on our site. A g plus would be really helpful because we can promote the category for all the kids. 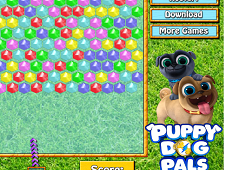 YOU KNOW THIS ABOUT Puppy Dog Pals Games? 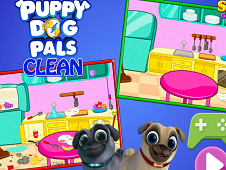 In Puppy Dog Pals Games page you can find 11 games that we've published for these kids and children that are interested to play Puppy Dog Pals Games, this game category have been created on 29.08.2017. 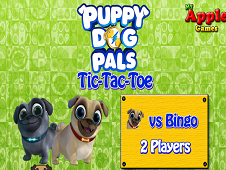 These games with Puppy Dog Pals Games have been voted a lot of times and we are inviting you to let a comment after each of this game.